The Russian economy is suffering from certain economic problems such as low oil prices and sanctions, but they are not chronic, just more like a virus that’s quick to cure, Andrey Kostin, head of Russia’s second biggest bank VTB told RT. “I think, the Russian economy is ill. And I compare it with illness when you have some chronic disease, when there are some structural problems and some virus. The virus is low oil price and sanctions. And, I think, virus is easy to cure or at least relatively quick to cure. Structural reforms and chronic diseases are much more difficult and take longer to cure,” Kostin told RT at the Economic Forum in Davos. Russia’s economic ‘virus’ is ‘manageable,’ as the country still has massive currency reserves and can pay its external debt, the VTB head said. 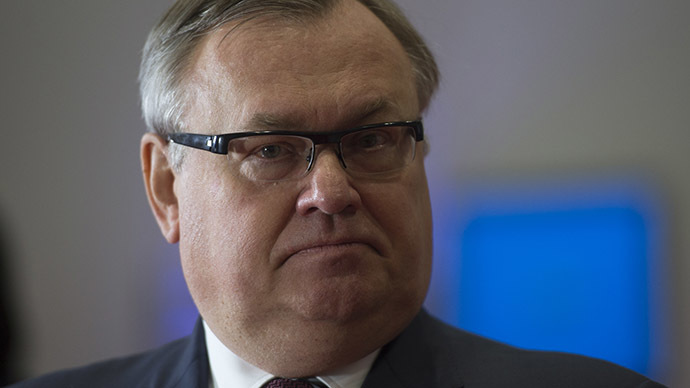 “I don’t see a drastic threat for the Russian economy,” Kostin added. However, the situation will worsen and now Russia needs to learn to live in a new reality. “I think, we lived in a little bit of a lavish style over the last few years because the beginning of the new century was quiet successful. The Russian economy was growing very fast, oil prices were very high. I think, we have to adjust our policy now and conduct reforms,” the banker said. Talking about the effect of sanctions, Kostin acknowledged that business has changed for his bank, but they are now actively looking for alternatives. “We have, of course, reviewed our policy because the open markets are closed for us, we don't have access to the capital market, we don't have access to the debt market, to a very big extent. Of course, we are looking for alternatives, for example-for the Chinese or the Gulf market,” he said. The critical issue for the Russian economy now is to bring down its key interest rate, hiked to 17 percent in an attempt to stop speculations on the ruble and cap inflation. But higher interest rates always translate into higher loans to firms and individuals, which can seriously eat into economic growth. “Of course the main source for capital and liquidity is the Russian Central bank and the Russian Government. The bank is in position to fulfil the major task to provide more loans for the Russian economy, and now the most important thing is to bring down the interest rate because 17 percent is extremely high for the Russian economy. The sooner we do it, the better,” Kostin concluded.